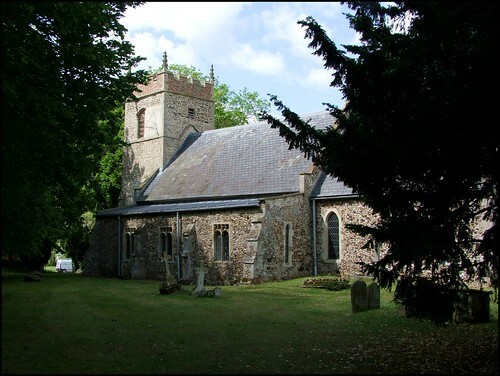 Wereham is just outside of Stoke Ferry - indeed, now that the Stoke Ferry church is redundant, Wereham includes part of Stoke Ferry in its parish. Wereham is, as Pevsner observes, a nice stone village. This is the carstone country, and we are also on the fen edge, facing across to the stone quarries south of Peterborough, some 30 miles away. This handsome church is set in a fine, tight graveyard, facing across to the village school and the pond. It is easy to imagine what this place was once like in the busy days of the early 20th Century. A good war memorial faces out across the pond, a reminder of the event which would change rural Norfolk forever. There is a fine sundial on the south face of the tower, but St Margaret is unusual in being entered from the west. It is unusual in other respects: the rigorous 1860s restoration disguises the fact that this church was largely complete by the 13th Century, an early date for Norfolk. You step into a building with a rather strange feel. The wide body of the nave (the south aisle is 13th Century, that to the north a Victorian imitation) and the lack of a clerestory accentuate the squareness of the space, while beyond is the beautiful sight of three Early English lancets in the east window of the chancel. In fact, they are not original, another Victorian confection. But the chancel arch is also 13th century, and so they may well replicate what was here before. The clear light of the chancel is a good setting for the self-aggrandizing memorial to John Heaton, but the best part of the church is probably the south aisle. Here, the monuments installed by successive waves of 18th and 19th century Wereham worthies were bolted onto plaster which concealed medieval wall paintings, some of which have been revealed by recent restoration work. This church seems to have been in pretty bad shape by the 1990s, but care is being lavished on it, and the tower has been fully restored. In the coolness of the north aisle, the simple altar at the east end is a beautiful sight.